Lionel Ferbos, New Orleans’ Grand Old Man of Jazz, celebrated his 100th birthday at The Palm Court Jazz Cafe on Decatur Street on Sunday, 17 July, 2011. 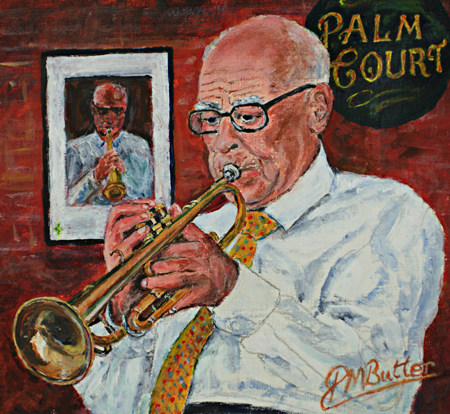 When he was a mere 99 years old I was honoured and proud to have my jazz painting of Lionel presented to him at The Palm Court. Recently I received the sad news from a close friend and jazz fan in LA: “Another famous jazz musician has died in New Orleans – Lionel Ferbos, age 103.
even then “the oldest active jazz musician in New Orleans and beyond”. Jazz in the tavern, jazz in Jackson Square. Jazz at the Palm Court, when Lionel is there. Lionel is ubiquitous and has been so for years. 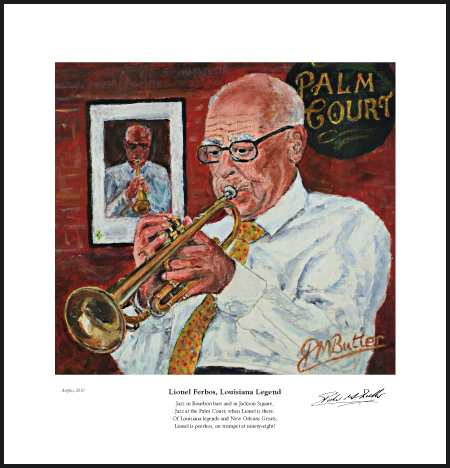 I write a poem to accompany each of my fine art prints of my jazz musician portraits and Lionel’s omnipresence inspired Long Live Lionel Ferbos.